Wednesday January 30th 1878 We got our work and baking all done this morning and in the afternoon Mother went down to see how Maggie was. I practiced two hours. And we got an early supper. The girls came over and we had a good time. Thursday January 31st 1878 We ironed today and in the afternoon I worked on my tidy. Hatt went to town in the evening. I practiced awhile and and the boys were down to sing awhile. 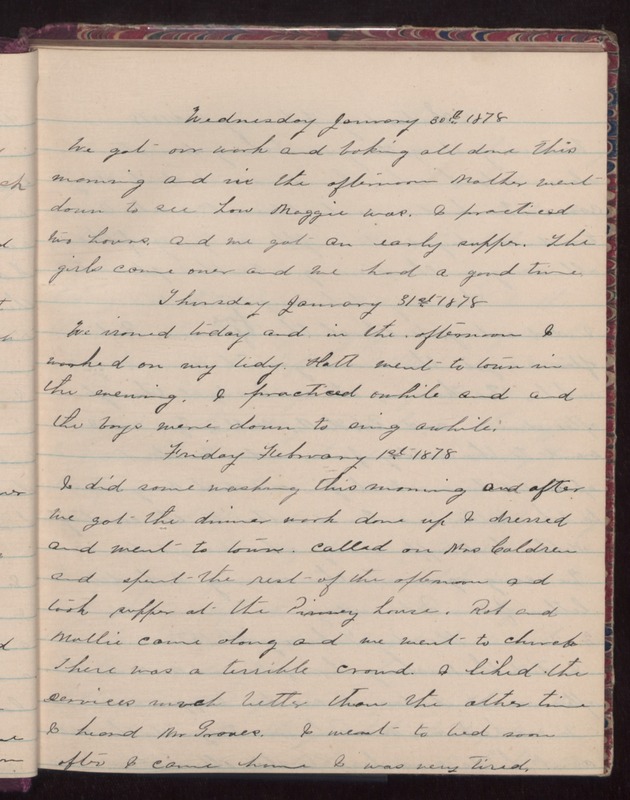 Friday February 1st 1878 I did some washing this morning and after we got the dinner work done up I dressed and went to town. Called on Mrs Coldren and spent the rest of the afternoon and took supper at the Pinney house. Rob and Mollie came along and we went to church. There was a terrible crowd. I like the services much better than the other time I heard Mr Groves. I went to bed soon after I came home. I was very tired.